Find a vacation home to rent in Kvinnherad Municipality from our list of vacation rental properties. Campaya has over 51 vacation homes available in Kvinnherad Municipality, which give you the possibility to locate a unique accommodation in Kvinnherad Municipality which completes your check-list in search for the perfect self catering vacation apartments in Kvinnherad Municipality or vacation villas in Kvinnherad Municipality. Spend your next self-catering holiday at this lovely holiday home, located near beautiful natural surroundings. This very nice fishermens style house is by a beach area on the Hardangerfjord, and is one of a terrace of four identical houses, N19601 - 604. Half of a two part holiday home, both independent and undisturbed by the other, situated by the Åkrafjord. Private jetty and the fishing in the fjord is very good. This new and very nice fishermens style house is by a beach area on the Hardangerfjord, and is one of a terrace of four identical houses, N19601 - 604. Welcome to a modern holiday apartment with two sunny terraces, situated in a quiet area. A great holiday home located in a beautiful scenery. Stairs from the garden and down to the dock which is great for bathing and fishing. Welcome to this cozy holiday home with unique location right down the water. Along the water is a long shoreline and good swimming and fishing opportunities. Welcome to beautiful Varaldsøy, the largest island in the Hardangerfjord. This holiday home is located right near the water on the Halsnøy Island. This is a car-free island. You can reach the shops, restaurants and the car park by boat which belongs to the house. Nice spacious house with homely decoration and a good location right by the Hardangerfjord. Large terrace with a magnificent view of the fjord and mountains. Private jetty and mooring. This delicious & very well equipped holiday house - with i.a. 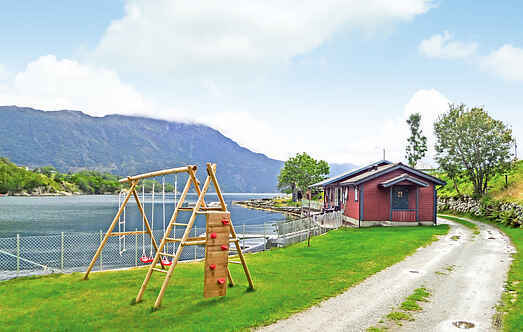 2 complete kitchens, 2 living rooms, and 2 bathrooms - is located close to the romantic Hardangerfjord. This large high standard holiday home is surrounded by beautiful scenery with good fishing in the sea and in fresh water. Plenty of parking place on the property.